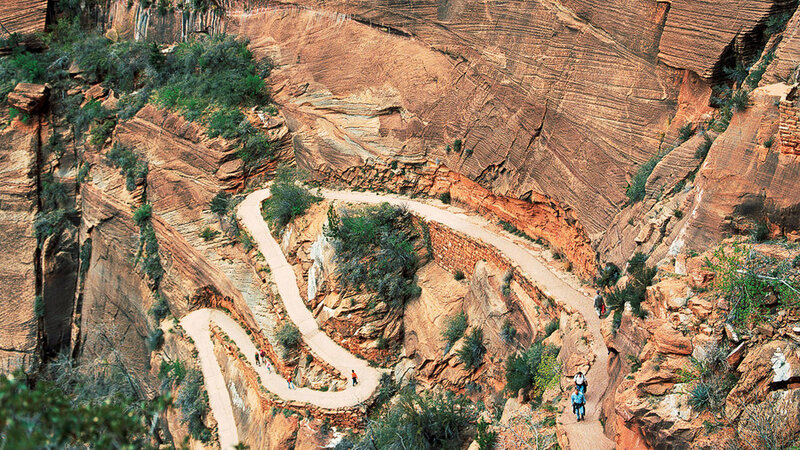 A steep and twisting trail to Angels Landing leads to prime Zion views at Scout Lookout. Here are our top choices for things to do when visiting Zion. Angels Landing. This is the hike you’ll brag about back home, assuming you’re up for doing it. You hike 2.5 miles up cliffs so steep you have to negotiate them with the help of chains bolted into the rock; the final portion of the trail rides a narrow rock fin with dizzily sharp drop-offs on either side. The reward: phenomenal views and aforementioned bragging rights. Trailhead: Grotto Shuttle Stop; 5 miles round trip; strenuous. Watchman Trail. This trail shows off some of Zion’s most famous landmarks, including the Towers of the Virgin and the Watchman spire that gives the trail its name. There’s not much shade along the route, so it’s a hike best done in the morning. Trailhead: Zion Canyon Visitor Center shuttle stop; 2.7 miles; moderate. Zion Narrows. The full 16-mile trip is one of the great adventures anywhere―you follow the Virgin River up into sinuously carved slot canyons. But it’s an undertaking, requiring park service permits, proper gear (including water-proof boots and walking sticks), and attention to weather conditions, notably summer thunderstorms and flash floods. More casual hikers can get a taste of the narrows by continuing upstream past the end of the Riverside Walk toward Big Spring; the park service offers frequent guided hikes here as well. Trailhead: Temple of Sinawava; distance: 2-4 miles; moderate. Taylor Creek. The hard hike follows the creek to Double Arch Alcove. Trailhead: 2 miles east of Kolob Canyon Visitor Center; 5 miles round-trip; moderate. Timber Creek Overlook. This short, easy hike gives a good introduction to Kolob Canyon. Trailhead: Kolob Canyons picnic area; 1 mile; easy.